So I've got some time on my hands for a while, and armed with a Gazetteer, Google Maps and last year's Wisco trout guide I've been thinking about doing some scouting of areas in the Driftless. I know about the books that are available, and Driftless Anglers, etc. I don't want your spot... in fact i don't want anybody's spot (I'd rather be alone, thank you very much). Ideally I'd like to find some areas that aren't too pressured and that have reasonably good public access. That being said I don't mind walking a bit, or slapping my Jeep into 4WD. I've identified a few spots on maps that i'd like to check out, but it's sometimes hard to identify where there's public access. Just looking for starting points for exploration, the closer to Milwaukee the better. I'm going to be in Madison a couple times next month and thought I might take some to have a look around at promising places to hit when the season opens. Any suggestions on general areas to check out? do you like the bookie photo on last year's regulations? it is a lovely brookie... one of yours? 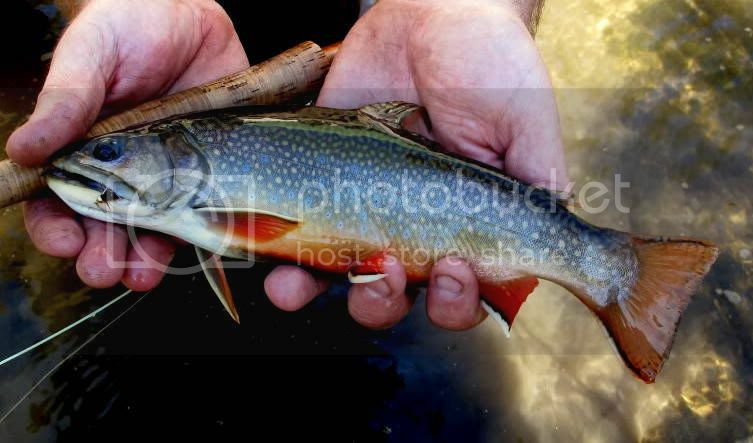 ive seen better brookie pictures in my day. i personally liked the drawings better. I hope your post was meant to be funny!!! I submitted this one to TU for this year's cover. Didn't hear anything back. I guess that was a no. My cover was chosen by the WDNR and TU volunteered to take over the cover art now. Congratulations Len!! Winter is when I fish the brookies here, but this winter we have had so much rain it has been a no go since November. Once spring arrives the poison ivy gets so thick I can't make it in to my brookie hole. Yeah it is really that thick and waist high. How long have you been entering your pics for the covers? The photo shown has a blue collar look about it that is very cool. we had a trout stamp competition here for decades. Folks would paint and a panel of judges would pick the winner. I was asked to be one of the three judges one year. They told me they were phasing out the competition. I told the head of fisheries I had lots of photos they could consider. I got an email from him in September and he asked me to submit a few. He picked the brookie photo. It was an old old photo of mine I took with a Sony Mavica 3.5 disc digital. The blue tint of the brookie sealed the deal. Mr.Harris can you post the picture that made the cover? Pre-season scouting Wisconsin, home area.